Initially I overcame inertia by just mixing colors and painting without a plan. I decided I did not have to paint a meaningful painting. Some vague notion of landscape would be a starting point. I didn't know what kind of landscape I would make - maybe a seascape, alpine meadows, water reflections or near non-objective abstract. Internal or external type was not decided. As I brushed on the acrylic paint covering about two thirds of the canvas, new thoughts of possible meanings flashed across my mind. When the four foot by five foot canvas was almost completely covered, I thought it was good. The painting was a nice backdrop to holiday clutter being decorative and calming. But if it was done in just three hours, it was void of a possible ricer involvement. So I took courage ignoring fears of spoiling the painting. My paintings are a pictorial journal of my life with some even becoming solutions to problems I have encountered. Time to paint when changes are near. The beautiful wood lot and ranch in back of our property is going to be subdivided. The view will be gone forever, but I will have a sentimental memory painting. 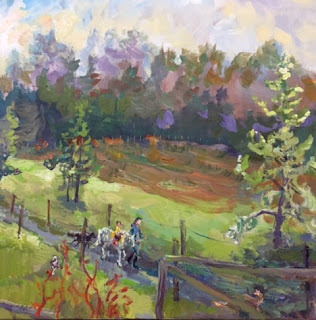 For awhile I thought I would paint a deer jumping over the foreground fence out at the viewer, which shortly occurred to me was merely an exercise to see how good I was as a painter - a short lived shallow reward for me. Once a painting solved a problem I had. I used to sign my maiden name to my paintings in hopes that I would find a long lost cousin when all the usual means of searching failed for a decade. A painting of a common ancestor published on a blog did result in one child of the lost cousin calling me. Then I visitited the cousins I never knew as a child. Though it is a long stretch, maybe a want to be ranching family will read this blog and buy all 13 acres and continue ranching while rearing their children like my painting reminisces. After blocking in the atmosphere and colors, each day I added a small pictures of my heart warming memories like the house decorated with Christmas wreath, along with the barn and horse arena. I have more memories that could be added like the chipmunks, rabbits, humming birds, robins, peacocks and steers. There were quail, China pheasant, owls, raccoon, coyote and skunk, shrews, mice and rats, hawks, woodpeckers and more. My husband giving a neighborly assistance in the falling of trees, and cutting wood, the tractor added too. The small family farm opens up the continuation of fundamental values upon which our greatness as a nation was built - neighborly caring for each other sharing our labors and bounty with one another. Urbanization of most of us is at the heart of our loss of empathy. saving this life style is important. Because in this season I was overwhelmed by adding so much, I placed the painting with the front to the wall in my studio out of sight until next year. The view outdoors had changed from being autumn to wintry frost. I was mesmerized by the pastels as the sun started to melt away the whites. 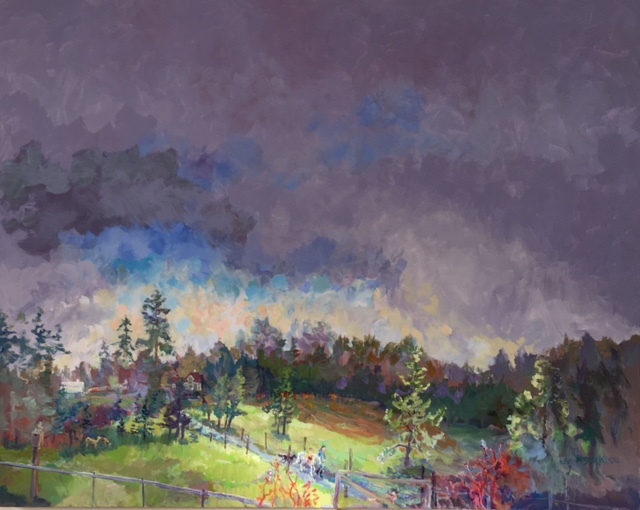 When the sun set behind the trees at 3:30 PM, the purples and greens died in my painting, only coming back to excite me in the early mornings when the sun glow peeped through the window. What is slowing the flow now? Wanting to paint a winter scene? Indecision? Would more additions take away from the pony ride? Or have the holidays called me to do some baking and shopping that I have been avoiding? Time to put it away until next year. I am too close to it to make a decision. I have successfully kept a flow going but not the holiday preparations. Enough is enough. Time to hide the painting away until next year when with fresh eyes I will determine if it is complete. Time for undivided time with family. Next year I will be ready to do more paintings of the neighboring ranch. I hope my Jewish friends are concluding their last day of a happy Hanukkah celebration and to my Christian friends a Merry meaningful Christmas with hope for peace for all faiths and beliefs in 2018. We are not multimillionairs. But if you sell your ranch, you could buy this one and be my neighbor. Reduce your herd to a few head. Maybe have a pony for the grandkids. I would guess if they can get it subdivided as much as you said, that land is worth a LOT more than our place, which we hope someday our son will have :). It is though a nice piece of land. And it'd be fun to live near each other again. Change is inevitable. New people move in and older places sometimes can find no one and die. It is what it is. Your painting captures (for you) far more than the scenic landscape. I really have almost decided to take up a painting course...almost. Just no time now for the demands that would entail. When the days are short, it is hard to think of devoting any time to painting or art. Of course a very good beginning can be to make it suit your needs. Like having a quiet time. Light a candle and make a meditation by making a little puddle of water inwhich you drop some color and watch it as it moves on its own until it dries. Another way is to paint with water on a Buddha Board and quietly watch as the water dries. Another way when you have too much going on to take on something new is to hang art that you admire in your home. These pieces of art will incubate your artistic voice. I like to just look at the art on Pinterest and this activity might appeal as well to you. I really like your painting, can hardly wait to see it again in the new year! leaving those trying to maintain a sustainable operation having once again to fight for their right to do so.